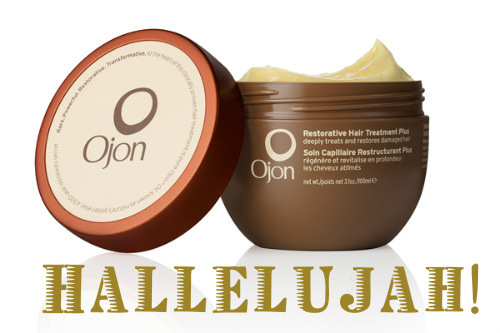 Ojon lighten up with new Damage Reverse Restorative Hair Treatment Plus! Those of you with sensitive sniffers can now breathe a sigh of relief because cult haircare faves Ojon have clearly been paying careful attention to their customers. The scent of the brand's star product, the Damage Reverse Restorative Hair Treatment, has long divided the beauty community with some loving it (including myself -- read what I had to say about it here), but others find it offputting, even comparing it to such such olfactory delights as stale ashtrays or wet cigarettes! Ojon’s latest launch should silence the critics and allow people to focus on what’s really important with this product: the results. They’ve just introduced a lighter scented version, Damage Reverse Restorative Hair Treatment Plus, which contains extracts of the fruit that surrounds each Ojon nut (called Rouge Oleifera, if you’re wondering), as well as the eponymous oil. Like the original version, the product targets very dry, damaged hair and the clinical studies boast some very impressive figures: 52% improvement in the hair’s condition in just one use, a reduction in hair breakage of 100% and up to 64% improvement when left on hair overnight. I haven’t tried this new version but I loved the original and congratulate Ojon on listening to their customers and responding so quickly to their feedback. Have you tried the original? What did you think of the scent? Damage Reverse Restorative Hair Treatment Plus will be available in Arnotts, Dublin from March, when it will be priced at €39. I agree - it's so lovely when a brand listens to what customers say and ACTS on it! The results sound amazing... I haven't tried Ojon but am tempted by this. Those are startling statistics- my hair is in need of some help at the moment! Still too pricy for me I think. Ya it's dear but, worth it I think? If it delivers on all its promises! I have an Ojon product, and to me, it smelled like an old lady. I loved how the product works, but couldn't get over the scent. So I stopped using it. I would love an unscented version of their stuff, but I would be willing to try a lighter scent.